So, Friday marked the 49th anniversary of President Nixon's resignation. To commemorate this event, we watched the Academy Award nominated film, "All The President's Men," which I hadn't seen in at least 20 years. Since I've been on something of a Robert Redford kick lately, and since I had written a poem about Watergate when I was in grade school (OK, we'll save that for later), it was entirely appropriate and just plain thrilling to sit through this two hours of fast moving, on the edge of your seat, "pre Aaron Sorkinesque" ingenious historical drama. Despite the charming anachronisms of typewriters (and relentless typing), feathered hair, dial-up telephones, and boat-like 1970's Dodge Chargers, there's a serious marketing takeaway from the movie: Woodward and Bernstein (W & B) totally hold up as modern day entrepreneurs who had the chops in real life, and in their depictions in film, to make their mark not only in their careers, but in changing the course of history. Here are all the ways they had "the right stuff," and rank #1 as modern day entrepreneur heroes -- who also happened to be journalists. Impressive in this film is how Woodward and Bernstein never give up. They run (and drive) around like maniacs, and keep going, even when they appear to be hitting a dead end. At one point about halfway through the film, Berstein sees a New York Times article that reveals information he was looking for regarding money laundering. Instead of getting discouraged, he uses the article to jump start his own research and investigation. W and B trust their instincts enough to push through the story and continue to investigate, despite putting their careers on the line and having doors shut in their faces at decidedly key moments. One of my favorite aspects of the film is how the reporters capture the essence of those they are interrogating by writing down their reactions on yellow legal pads, emphasizing and heightening the drama. They quickly jot down names and quotes, draw arrows, cross out words and lines, giving all the action a real time effect. Kind of like social media, if it had been invented yet. 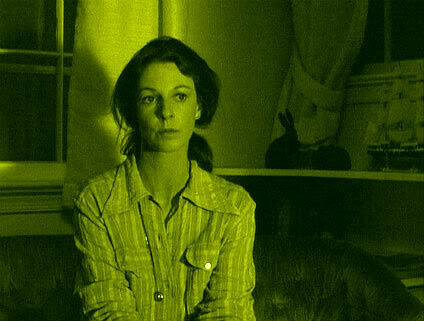 "If you could get Mitchell, that would be beautiful," Jane Alexander's character states. The investigation comes to a standstill when W and B question a woman they think was a member of CREEP, only to find she is a clerk in a department store. Instead if dropping the story, they use this as a turning point to question all the committee members again, including Jane Alexander, who plays a terrified Republican bookkeeper who divulges key information. 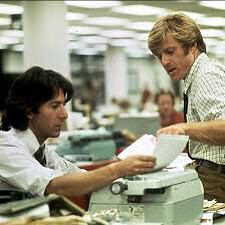 Redford and Hoffman playing Woodward and Bernstein, are perfect foils for each other. There's a real synergy and passion as they compare notes, type alongside each other, and even type notes to each other in the famous scene when they are aware they're under surveillance. Redford and Hoffman relentlessly ask questions during the entire length of the film, not satisfied until that get answers. A great entrepreneurial lesson that you have to know what you don't know, to succeed. 8. Have a great meme. "I don't mind what you did. I mind the way you did it." "Nothing's riding on this except the First Amendment of the Constitution, freedom of the press, and maybe the future of the country." "The list is longer than anyone can imagine." So...over to you. Do you think Redford and Hoffman can be described as entrepreneurs? What do you think this movie does for journalism, and does it hold up by today's standards? What's your favorite scene in the movie? Share in the comments.